Production of compressed air does not end with its compression, but continues with treatment. Treatment of compressed air is a process during which the air is further treated so that it meets the requirements set by standard ISO 8573 and can be classified in one of the stipulated classes for the quality of compressed air depending on water, oil and solid dust particle content. Dryers are used to remove water from compressed air. These are differentiated by the applied drying technology into condensation, with a maximum achievable pressure dew point (PDP) of +3 °C, and adsorption, capable of achieving negative PDP values of up to -70 °C. Various types of filter are used to remove dust particles and oil residue, from coarse dust filters to very fine filters, which are capable of filtering oil vapours and undesirable odours if a filter with active carbon is used. As well as these basic accessories, there is also additional supporting equipment, such as cyclone separators, condensate removers and water/oil separators. 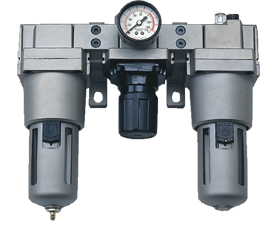 Cyclone separators are used to roughly separate water from the compressed air, thereby increasing the effectiveness of the dryers. Condensate removers draw condensate from the over-pressure area into the area with atmospheric pressure. Water/oil separators remove oil from the removed condensate so that it can be safely and ecologically discharged into the sewers. In all these areas of air treatment we are capable of offering equipment by renowned manufacturers, such as Hankison, Parker, Zander, Hiross, Beko Technologies and many others, with which we have partnerships spanning over twenty years and with which we have realised a great many projects.